Get Out of Pain and Back To Living Your Life To The Fullest On Your Own Terms. Take control to transform your body and transform your life. Feel better, move better, look better, and perform better -- every day, in every way. Already a member of EBM’s online family? Click below to log in. Stop letting pain rob your life of all the joy and happiness you deserve. In your low back, limiting your ability to perform even the most basic daily tasks. In your knee, making in dam near impossible to deal with stairs. In your neck or shoulder, preventing you from getting a good night’s sleep. No wonder you find it so hard to stay active, stay in shape, and keep the weight off. And the most painful thing of all is staying the same, instead of getting back to the person you used to be. That’s the real you, the one who was ready to conquer the world at work, throw around the ball with your kids at or hit the gym hard. But these days you don’t like what you see in the mirror. You wonder what happened and how you can fix it. Some days, you even wonder if it CAN be fixed. Maybe this is your new life. But it’s not one you like. The Pain Of Staying The Same. 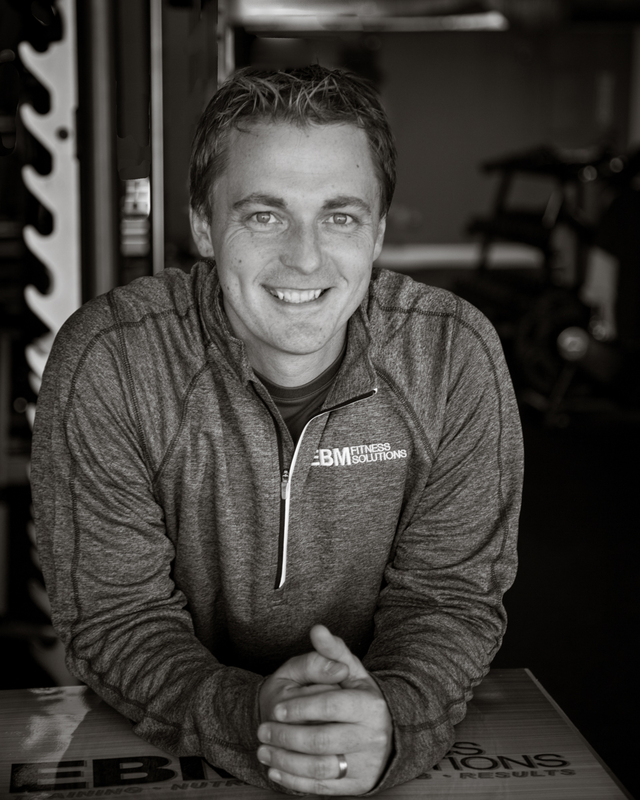 I’m Dr. Tom Biggart, a physical therapist and strength coach who integrates my rehab background with my fitness background to help people train smarter and harder while reducing or eliminating pain that holds them back. I help people move better, have less pain, and get back to doing things you thought you could no longer do. If you describe your pain as “coming out of nowhere” or constantly state that “I didn’t do anything” when describing your pain, then you are in the right place. There is a complex interplay between how muscles contract and how joints move. Tightness in a joint, trigger points (or knots) in muscles, old injuries and/or pain can all negatively impact your ability to move properly. But here’s the good news. The pain and movement issues are all completely unnecessary. You can get better! It can be done. It has been done. And you can do it, too. Just ask my client, Jeff. After an injury, Jeff reached a breaking point. He came back with a vengeance. I remember the exact day that I decided to make a change. It was July 15th, 2009. I was visiting Massachusetts from North Dakota, and I was at a relative’s birthday party. A vicious game of backyard volleyball had broken out. I was 29 years old, weighed 270 pounds, and I was horribly out of shape. Some type of injury was inevitable. A few moments later in the game, I was lying on the ground with a mildly sprained ankle and a severely bruised ego. Dr. Tom was present that day for that fine display of athleticism. After tending to my ankle, Dr. Tom and I chatted briefly about fitness, and that is when I decided to make a change. A week later, I received a tailored workout via email from Dr. Tom. Along with the workout were short videos of Tom explaining and performing the exercises that made up my workout. The videos complimented my workouts perfectly. Dr. Tom did a great job explaining each exercise and also how all of the exercises related to each other throughout the workout. When I did have a question, Dr. Tom responded immediately. The workouts themselves were nothing short of amazing. I was in and out of the gym in less than an hour. At first, my particular routine consisted of a total body workout, followed by only 10-12 minutes of cardio. Over time, Dr. Tom would produce a new workout to keep things fresh and interesting. Always keeping previous injuries in mind ( I have arthritis in both knees), Dr. Tom would tailor my workouts based on my current fitness level, and how I was feeling overall. This level of attention and interest in my well being and success helped motivate me, and led to my success. September 2010. I had returned to Massachusetts to visit family and friends. I was now 31 years old, weighed 185 pounds, and I enjoyed my life more than ever. Looking great and feeling great led to a level of confidence I had never felt. People that I had grown up with could not believe how I had changed. I owe my success to three things. 1. The amazing personalized workouts and videos that Dr. Tom had provided for me. 2. A common sense approach to nutrition that Dr. Tom and I discussed throughout the whole process. 3. Dedication to the program and committing to my new lifestyle. Jeff discovered that his previous way of thinking and exercising were not working. He opened his mind to a new way of doing things. And it paid off, just as it can for you. A Secret Revealed: What I Learned Working At Gyms And How It Will Help You. At least 50% of people training there were dealing with some sort of injury. And there were many other issues. For starters, they were confusing getting sweaty and out of breath with getting in a good workout. Many people have no plan or use the wrong plan for the current stage of their journey. Or they only do the things they are good at, ignoring what they should be doing. They perform exercises they are not qualified to perform and doing too many sets and reps, increasing the danger of injury or re-injury. And the biggest issue of all? People who use cookie-cutter programs they get from magazines, their buddies, or semi-qualified trainers who have big biceps and a certification they picked up over a weekend, but not much knowledge of how the body works or how to get people out of pain. But you don’t need to resign yourself to living with pain. The Answer Is Expert Guidance And A Custom Plan, Handcrafted Just For You! shoulder pain that prevents you from doing anything above shoulder-height….even reaching into a cabinet. pain keeps you up at night. This lack of sleep is starting to negatively impact your training, your job or maybe your ability to be a non-yelling parent. You want to run more. You want to play more with your kids. You want to resume doing things that you used to be able to do without pain. You’ve tried finding the answers, but what you’ve been lacking is the expert guidance and support to get you there. There is no reason to go this alone. And really, how well has that been working for you? Pain does not get better over time. It might go away but when it comes back it stays longer and is more intense. And this cycle will continue to repeat itself and eventually involves surrounding tissues and structures. A key to getting better is acknowledging that what you are currently doing is not working and you need some help to fix it. It’s time to change and get out of pain once and for all. You know what else is pretty cool? We can also address any other fitness-related goals at the same time. Many times, people want to reach a goal but their pain slows or stops their progress. Once we remove your pain, we are free to crush whatever other goal is next on your list. What does the future you have to look forward to? Waking rested because you have been sleeping through the night because your pain is no longer keeping you up. Playing 18 holes with no pain and only feeling tired at the end of the round...not like someone was clubbing you with a baseball bat the entire time. Being able to go run and play with your kids without the fear that something is going to hurt from keeping up with your kids. Waking up in the morning and you can walk down the stairs with no knee pain and no fear that you will go tumbling down the stairs. The keys to successfully managing your pain is an assessment by a qualified professional. Once your movements are analyzed, I’ll put together a custom program for you. Then you’ll execute the plan. Just making you aware that you are moving in a way you shouldn’t is often enough to get the ball rolling. It is also important not to overreact to how your body is feeling. If you have a good day and are feeling amazing, DO NOT go out and do a whole bunch more than usual. This is s surefire way to light up your symptoms. By the same token, if you are feeling lousy, do not avoid doing your exercises. Consistency is the key. You need a customized plan that addresses all areas of impairment….not just one. You need someone to walk this path with you. You need someone to pull you back when you start running too soon. You need someone to virtually smack you upside the head when you do something dumb. EBM’s Online Training is the answer. You’ll get everything you need. Your program will improve how you move, address weakness to decrease pain and build muscle so you stop wasting time in the gym! Simplified tactics that build strength, improve how you move and decrease pain. Seamless integration of what you want and what your body needs with a custom program, handcrafted just for you. No one gets the same program! Programs designed to fit your schedule. Workouts are designed to be efficient, but thorough. Programs can be designed around varying amounts of time spent in the gym and varying days per week you want to train. Online support delivered via EBM’s Online Training app. Your workouts, along with me, are just a click away on your phone…. so keep us somewhere appropriate, ok? This comes complete with a video library of movements so you are never left wondering “what should I be doing in the gym today” and/or “am I doing this right?”. Still, have a question? Take a video of the exercise in question and it gets uploaded to your dashboard for me to review. Answers for all training questions so that you begin to own the process and become self-sufficient. Everything in your training program is there for a reason. If you find yourself wondering why you are doing a certain exercise simply ask and I will be happy to explain my purpose. Finally, you will have a training program built specifically for you. This will keep you confident and moving forward without injury or burnout. A flexible plan that fits any lifestyle which will help you lose belly fat, tighten your “trouble spots” while still allowing you to enjoy food as part of your life. Based on proven principles, your program will work to improve habits and behaviors as they pertain to food. This will increase your health from the inside out. By addressing internal health, you will begin feeling better and more able to execute your program. Design a nutrition program you can follow. Everyone’s situation is different. The goal is to balance your goals with real life. Work dinners, family dinners, kids, heritage, allergies and likes and dislikes will all be considered when coordinating your plan. Online accountability to ensure you are keeping consistent. Weigh-ins and progress pictures are crucial and provide valuable feedback towards your continued transformation. Answers to nutritional questions so you understand why you are doing certain things and not others. This helps to foster good habits and allows you to maintain the plan over a long period of time. No crash and burn here! Does this sound too overwhelming? Like it cannot possibly be done? That is what Tim thought too. We I first met Dr. Tom in 2007 I was at a point where working out did not help in my health and weight issues, clearly, I was doing thing incorrectly. Dr. Tom evaluated from both a physical program, nutritional program and well as a psychological level, as I am not the norm in regards to how my body reacts in certain situations. By working with Dr. Tom, I saw immediate improvements in my flexibility, weight loss, and consistent workouts. My background and health issues were high blood pressure, lack of flexibility, knee and back issues, all of which Dr. Tom addressed and keep me “grounded” in my workout to ensure I do not take any “steps” backward in my overall health. I have followed Dr. Tom now to four gyms/fitness centers as I also now also receive Physical Therapy from Dr. Tom when needed, which is another advantage above and beyond just workout programs. I have lost and remain within 5 pounds of the 83 pounds lost. I would say the best thing Dr. Tom brings to the table is his eagerness to understand your individual situation and needs and continuously “helps” in all areas of fitness. His input and feedback do not stop after the workout, as he does reach out when needed to keep you aligned and to see how you react and are doing. I worked out regularly but Dr. Tom was able to align both from a flexibility perspective, overall training and well being and to me most importantly an analysis and plan from a nutritional perspective. The later allowed me to immediately increase, energy and to also allow me to lose weight and keep it off! Working with Dr. Tom has allowed me to excel overall in all three major platforms, personnel tailored training, nutritional and overall well being. I would highly recommend Tom as both Strength Coach and Physical Therapist as he brings a well rounded overall strategy in well being. He evaluates all aspects of your routine and frequently makes changes to enhance and keep you motivated. I have tried many trainers prior to Dr. Tom, diets and all the rest we all struggle with and if I did not see the results, I would not have been with him for so long. Dr. Tom adds the personal touch also and reaches out to ensure I am okay in those instances where I was not feeling well. I wanted to update my status with regards to my overall health and well being, based on my time working with Dr. Tom. As previously outlined, I have been associated with Dr. Tom since 2007. When we started working together I was working in an extremely stressful environment that included extensive global travel. I had developed phlebitis and DVT (blood clots) in my legs. My weight was also a major issue. My PCP told me that if I did not take better care of myself I would not be around for my 50th birthday. I worked with Dr. Tom on all life-impacting issues that I had, but it wasn’t until I retired (2/2/18) that I realized more than ever the effect this had had on my body. I recently had a medical assessment which showed all the hard work has paid off. I have never had better results! My stress level has decreased and my overall health and well being have improved; not just from removing myself from the job but from my learnings with Dr. Tom! His voice is in my head constantly while working out; maintain your posture, more reps instead of more weight, just to name two. Tim was skeptical due to previous experiences with trainers and his complex medical history. Tim had great success. You can too. Let’s get you back to doing what you want when you want. The days of letting pain dominate your life are over! Time to get started. Click below to start your journey.